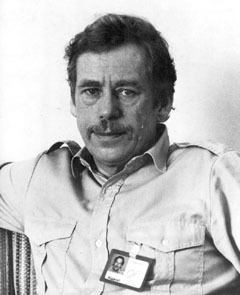 Vaclav Havel, the Czech poet and politician, who died on December 18, 2011. Václav Havel often said we should live life “as if”—as if there is no oppression, as if we must set an example of life well-lived even under the weight of a coercive regime. His belief in the power of exemplary actions undertaken by ordinary people—as opposed to the more formal political acts of revolutionary leaders—set Havel’s approach to resistance apart. He did not ask for heroics. He recognized the revolutionary force of everyday examples: not bowing your head, not putting the picture of a tyrant on your wall, not voting in farcical elections, not hanging the party sign in your shop window. Havel’s hero was the greengrocer, the powerless, the everyday casualty of oppression. He insistently resisted the epithet “dissident” because he did not like the idea of recognizing only one or two people of extraordinary courage and repute. Instead, he felt that there are no small acts of resistance; any act, by anyone, has the potential of reverberating—of being absorbed and replicated, and leading to meaningful change. Of course, the context dictates the significance of the act, and an awareness of that environment makes for true political consciousness and authentic acts of resistance. Havel’s work stands as a remarkable articulation of what responsible action could look like under the extreme conditions of Eastern European totalitarianism, but the value of his inquiry extends beyond that time and place. Indeed, he expected political ideas to cross boundaries of time and place. Havel the playwright and Havel the dissident intertwine in a philosophical tale of resistance and responsibility that has sparked action the world over. This is the stuff of which revolutions are made. Yet his call to political action also applies to the less extreme but equally important ways in which consumer societies with gross inequalities erode a sense of human connection. His life and work exemplify a kind of interplay between the private individual and the political world, between personal responsibility and social consciousness. Resistance can and must be reawakened within each of us. A year of revolutions has ended with the death of a true revolutionary, but we should rejoice in seeing Havel’s spirit endure in the actions of ordinary people from Cairo, to Russia, to Wall Street.